Many of our customers have asked us about the process involved in reproducing a sampler from a museum. First of all, a great deal of time, effort and expense goes into this. We go to the museum in person to see the actual sampler and in some cases we go several times. The piece is studied very closely, both the front and the back are examined. Many notes, diagrams and measurements are taken. Some charting is done, colors are matched and numerous photos are taken with many closeups, again of both the front and the back. The curator is consulted and if there are any questions we ask an expert. A licensing agreement is signed with the museum detailing terms and royalties to be paid to them. Once home again the sampler is charted and a model is stitched. We try to ensure that everything is as accurate as possible and that you get the actual historical experience of stitching the sampler and that you actually have purchased a reproduction and not an adaptation. Our aim is to have samplers from as many countries as possible from which they originated. We strive to find and use materials which are as close to those used in the original sampler. Our 100% linen fabric is either exclusively dyed for us, hand dyed, or in it's natural color. The colors of the DMC floss or the AU VER A SOIE silk floss are matched to the original sampler. All of our kits include a colored picture, photograph (or both) of the completed sampler, a chart of the design, embroidery floss, linen, needle, instructions for working sampler, a stitch diagram and any historic information we have on the sampler. 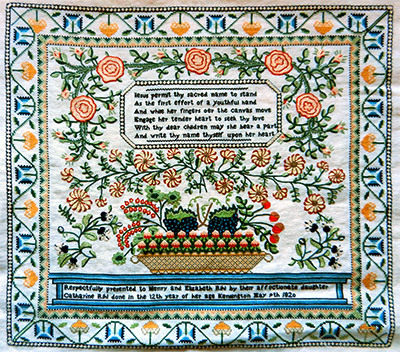 Some of the samplers use unusual and sometimes complicated stitches and complete instructions are given for these. We DO NOT substitute easier stitches for the difficult ones. About half of our samplers are available as charts. This includes a chart of the design and instructions. We strive to keep the reproductions as accurate as possible and, therefore, leave in the mistakes made by the makers. Update information is sent out approximately once a year. Once you have ordered from us, you will be kept on our mailing list. Antique Samplers Fostering the study of and education about antique samplers. Access Commodities Threads, designer kits, linen, accessories, & tools.